Triathlon and Cycling in Greece: Indoor Rowing energy expenditure: How many calories can you burn while on indoor rower? Indoor Rowing energy expenditure: How many calories can you burn while on indoor rower? An excellent calorie calculator, which estimates the amount of calories burned based on your body weight and activity is provided here: http://concept2.co.uk/training/bmr_calculator. 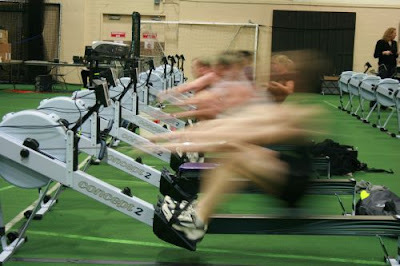 You will be amazed on how many calories can an indoor rower burn! This is also an excellent way to find out how much training you need to complete to get rid of unnecessary weight! Notice that indoor rower is a great calorie-burner! Below I quote the results for my body characteristics inputting 3 indoor rowing sessions (note, that I normally execute separately each of those training sessions, but for illustration purposes I've added them together on a single day to outline their calorie expenditure). The BMR for a 105 kg Male, 30-59 years old, is 2080.5 kcal. The training cost in activity of each exercise is calculated as your HMR multiplied by the Physical Activity Ratio of the exercise multiplied by their time in hours. See the Energy Costs page for a table of the different PARs for each pace. The total energy cost of your day is, therefore 5,618 (that is to say, your overall BMR plus all your exercise sessions). The process outline here is a guide to your energy output and is a good place to start if you are interested in weight management. The other aspect is knowing the calorie balance. Energy is provided by three food groups, carbohydrates, protein and fats. The relative balance between these groups is 60% carbohydrates, 17% protein and 23% fats. Carbohydrates and protein provide 4.3 calories per gram and fat provides 9 calories.